A library is a store-house of knowledge. Its expansion began from the dawn of civilization. It has a very important role in the development of society and civilization. In fact it is in the centre of all education and research organizations. So, library is a very essential part of all academic institutions. It keeps its door open for the teachers and students for their reading, study and research works providing them with innumerable new information, messages of new inventions and other necessary documents. 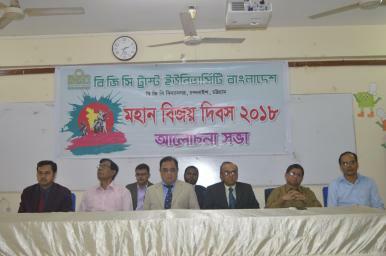 BGC Trust University Bangladesh established a library in 2003. Large number of books and other resources are there to meet the demand of the students and teachers. It is guided by a high powered executive committee headed by the honorable Vice Chancellor. The BGC Trust University Bangladesh library has collected a large collections of books, journals (national and international), CDs & DVDs, different types of Research Reports, Daily Newspapers, Current magazines etc. Every one is welcome in the library to read and consult reading materials, but only valid library members may actually borrow library materials. Every student can borrow two books for a week against his/her library card. Every teacher can borrow ten books for a semester against reading card. Reference books, journals, audio-visual materials and other important materials of the library shall not be issued from the library without permission of the library authority. All kinds of books, journals, periodicals and periodical audio visual materials shall be issued to the student for use in reading room inside the library. Every student can borrow maximum two books against his/her library card for a week and renew them once for seven days. No official documents will be issued to the students, faculty and officials without library clearance. All kinds of dues must be paid/refreshed for clearance. Students must return the library cards for Library clearance. Pin drop silence is a pre-condition for library atmosphere - every reader should follow it. The library is a place for study; the behavior of students should reflect this and students should respect the needs of others. Library membership card is a must for being entitled to use library materials/ documents. Personal possessions shall not be allowed in the main library except exercise books (Khata), pen, geometry box and calculator. Personal reading materials or any type of printing materials, diaries and spiral bindings are also not allowed inside. Library safekeeping is only for keeping the personal possession i.e bags etc. of the readers (Money or other valuables should not be kept inside the bags). The University authority will not be responsible for any loss or damage of the belongings. Gathering unnecessarily in front of the circulation and safekeeping counter is not allowed. A student can borrow two books at a time for a week. Two copies of the same book cannot be borrowed. Borrower will be responsible for his/her document. First come first served system will be followed. Reference copies can be issued only in special cases at 3.30 p.m. and must be returned on the next opening day at 9 a.m.
Materials must be returned on/before the due date. Mobile phone must be kept switched off and should not be used anywhere within the library. Foods, drinks, (except plain water), smoking etc, are strictly prohibited in the library. Writing or marking on books/reading materials and reading table is strictly prohibited. Any damage or loss of library materials will entail a fine that may be two times of original price. Students are requested not to shelve the books. Serious offences will be prosecuted immediately under the University’s code of discipline, and will result in suspension of the library facilities pending inquiry or punishment decided by the authority. Willful misuse of library facilities may result in termination of library membership or any punishment given by the authority. The library officials /staff and the students who are on duty have the authority to check any student at any time if necessary. The card must be returned after completion of the program. The librarian reserves the right to introduce new rules in consultation with the administration if situation demands. 1. 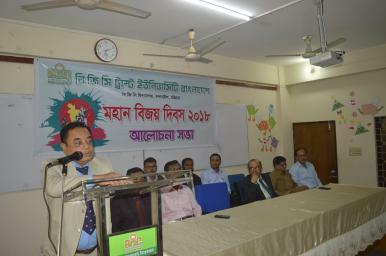 Teachers/ Officials: Teachers and the officials can become members of BGC Trust University Bangladesh library. For membership they need to fill in the prescribed membership application form and submit one copy of passport size and one copy of stamp size photograph. They need the recommendation of their respective heads of the Departments. 2. Students: All students of BGC Trust University Bangladesh have easy access to library membership. A student needs to fill in the prescribed membership form attaching one passport size and one stamp size photographs and the Bank receipt of library caution money for obtaining the library card. The Library card may be obtained on payment of Tk. 600.00 (Six hundred only) of which Tk.100 (Non-refundable) is the charge for the library card and Tk.500 is the library caution money which is refundable on completion of the respective program.